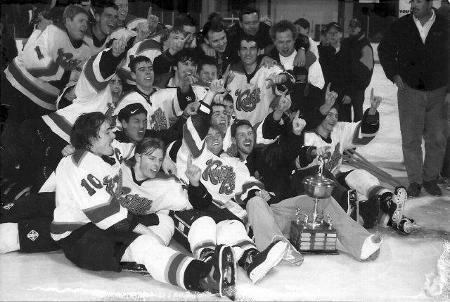 The 1996-1997 Kemptville 73’s Junior “B” Hockey team had a season of unparalleled success in the history of the association. Largely comprised of local players and coaches, the 73’s went through the regular season undefeated, finishing in first place in the St. Lawrence League. With a record of 38 wins, 0 losses and 4 ties, it marked the only time any team went undefeated during the regular season. The team then advanced to the playoffs and again made their community proud. The team won not only the St. Lawrence playoff championship, but the Rideau/St. Lawrence playoff championship as well, before advancing on to win the Eastern Ontario championship. It was the first time in Kemptville Junior “B” history to win the overall championship. The playoff record was an impressive 16 wins and only 5 losses. It was exciting hockey played by a group of dedicated and talented boys. Their history making successes were recognized by Jim Jordan, MP of Leeds and Grenville in the House of Commons and by Kemptville Council’s declaration of a “Kemptville 73’s Day” complete with a parade and a meet and greet featuring these local heroes.